Below are photos from a visit I made along with other members of Historic Easton to the Miller’s House in what is now Wye Mills back in April. The Miller’s House was built by Edward Lloyd III in the 1700s to attract a miller to the area as local agriculture transitioned from tobacco-based to grain-based. 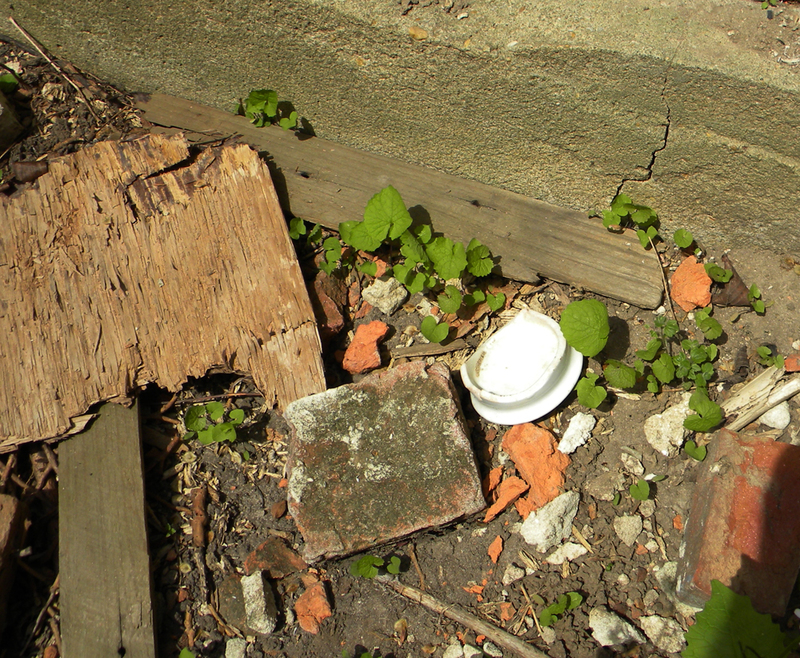 After sitting vacant for years, the home has fallen into quite a state of disrepair. 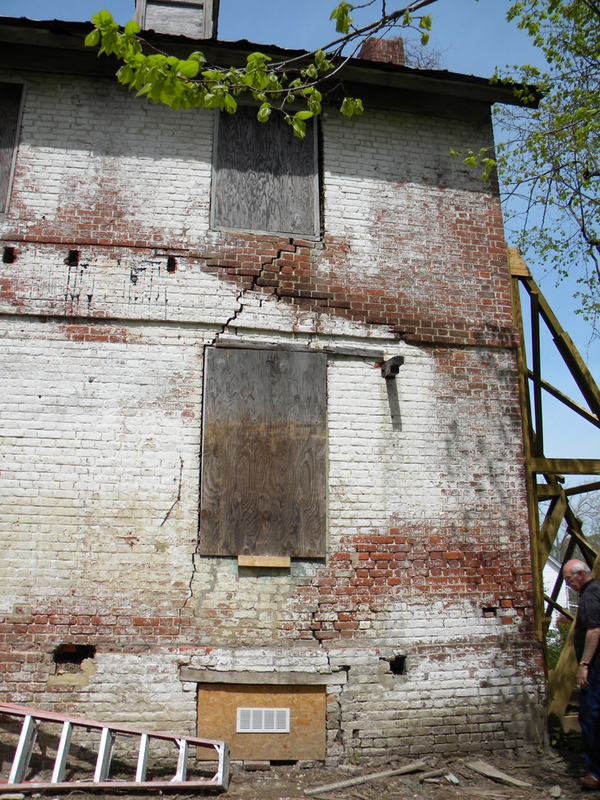 Historic Easton is trying to stabilize the house before it falls down. 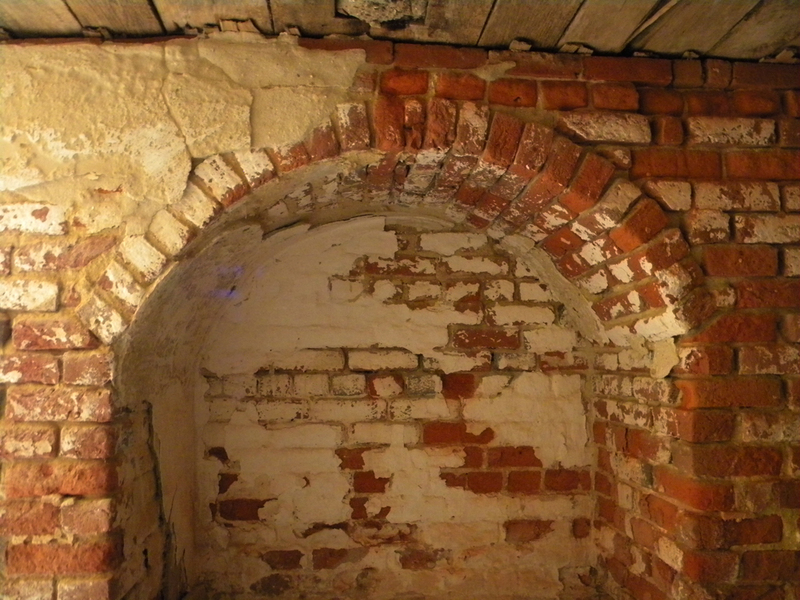 While we have grants to help cover some of the work, we are seeking support from anyone interested to help offset costs (donations can be made via Paypal to historiceaston@gmail.com). 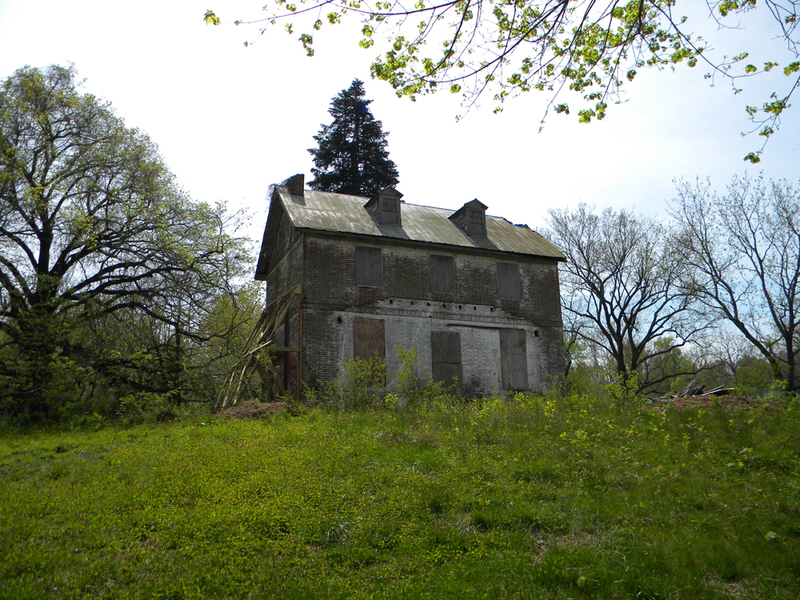 The Miller’s House, perched on a hill above the Wye Mill’s area in Talbot County, Md. A security fence has since been constructed to protect the house. A closer view of the other side of the house. There is significant damage to this side of the house, which was compounded by last year’s earthquake. 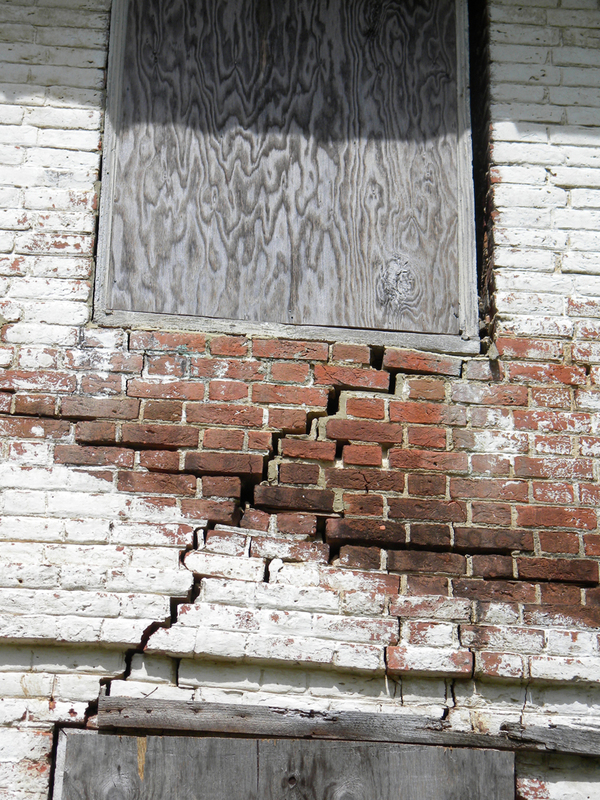 Close-up view of some of the damage to the exterior wall. Various means are being employed to keep the walls from moving any further. Supports also are holding up the floors. This picture was taken in the basement of the house. 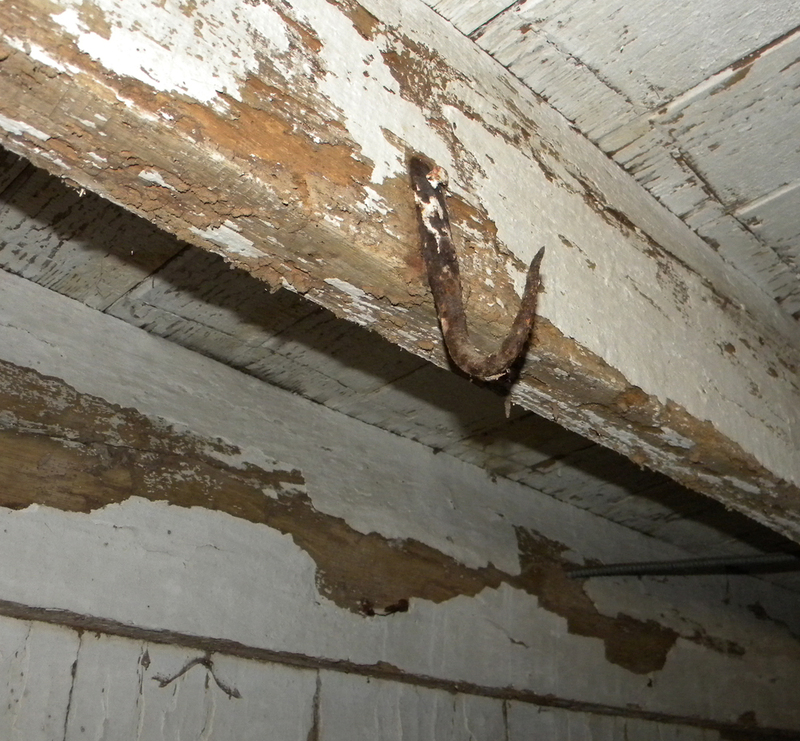 This hook is embedded in the ceiling of the basement. A woman whose aunt used to live in the home said that the family lived in the basement during the summer because it was cooler. 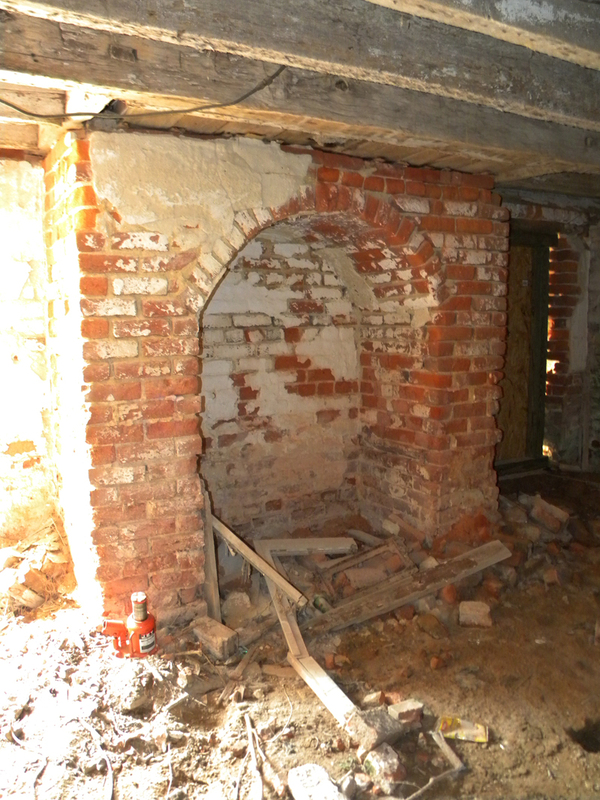 Closer view of the brickwork. 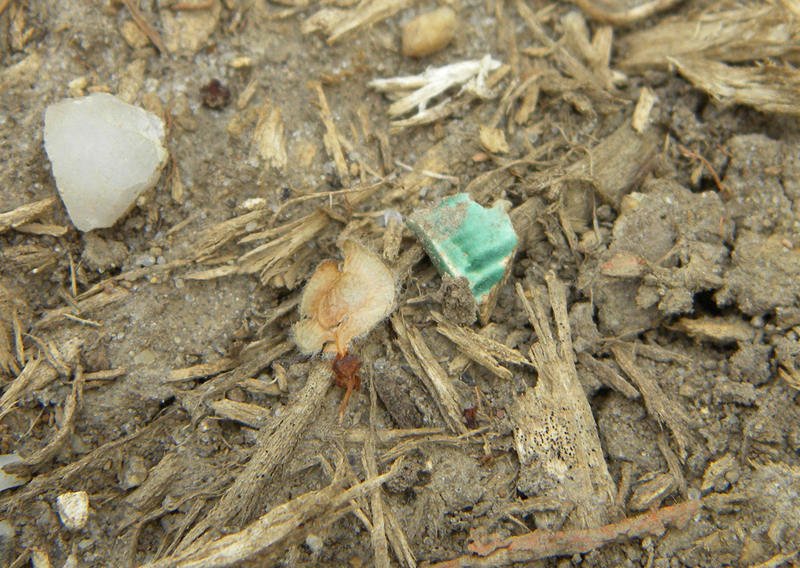 A piece of pottery in the rubble outside of the house. There is a cemetery on the property — I’ll be helping to map out the gravestones when the weather cools and vegetation dies back. 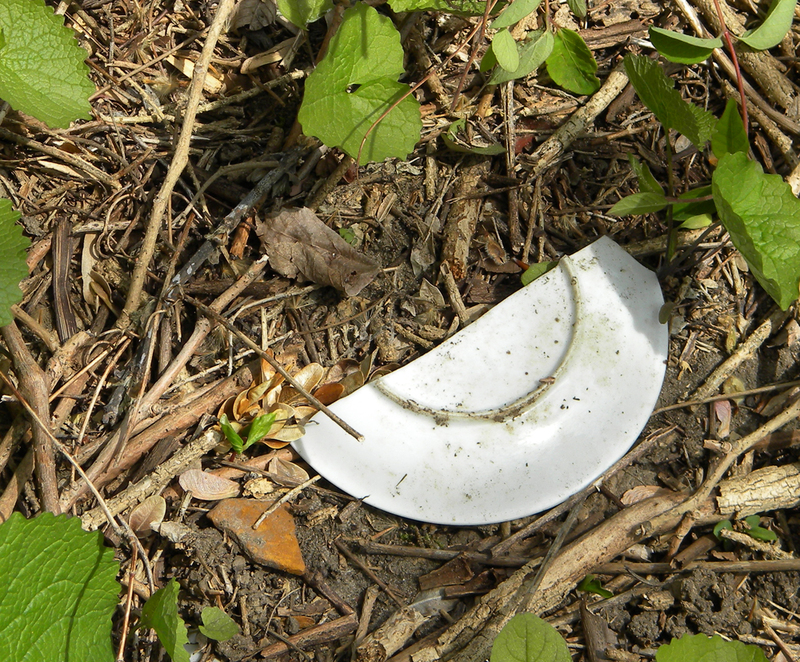 A piece of pottery in the cemetery. 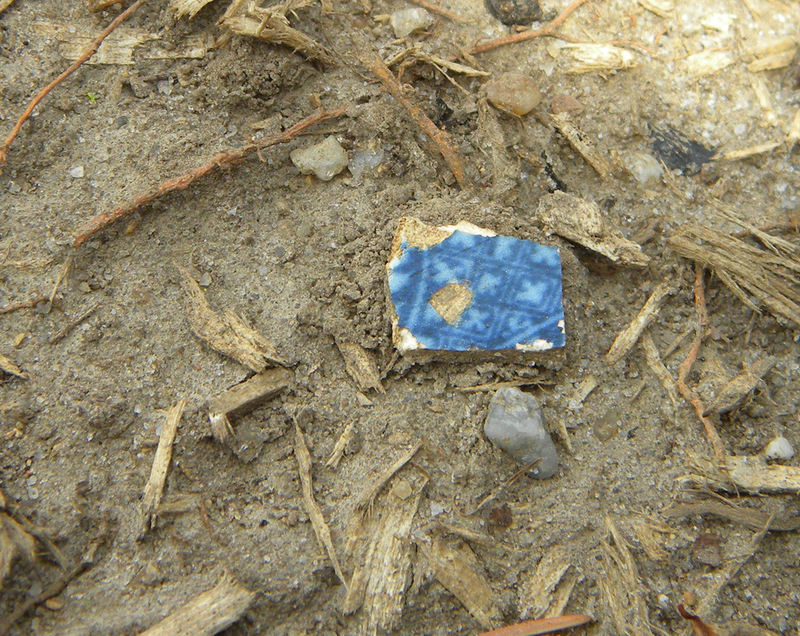 Pottery fragment on the ground outside of the home. 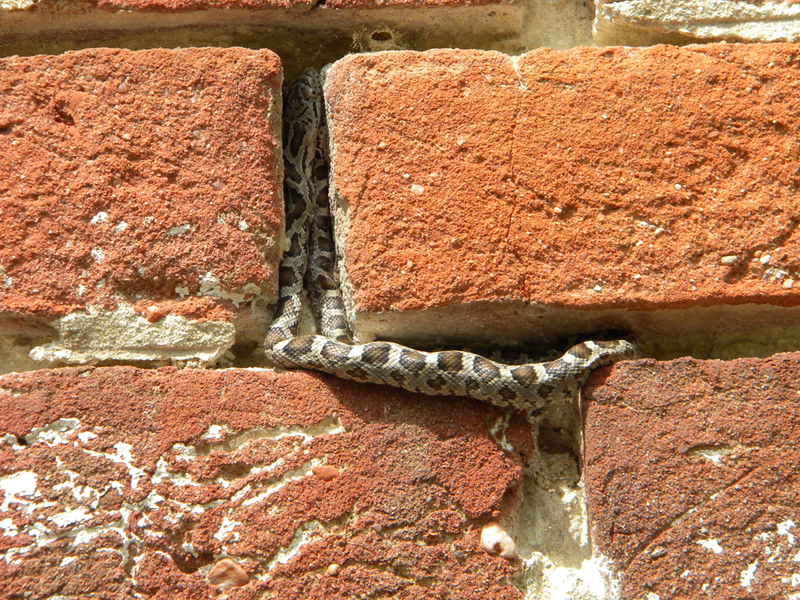 Snake sunning itself on the brick exterior of the home. 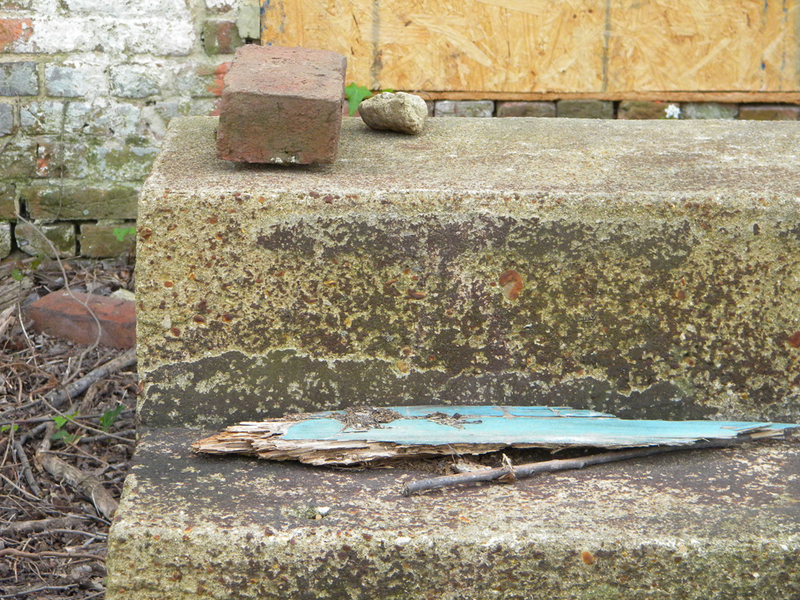 Debris on steps outside of the house shows the color that one of the porches used to be. 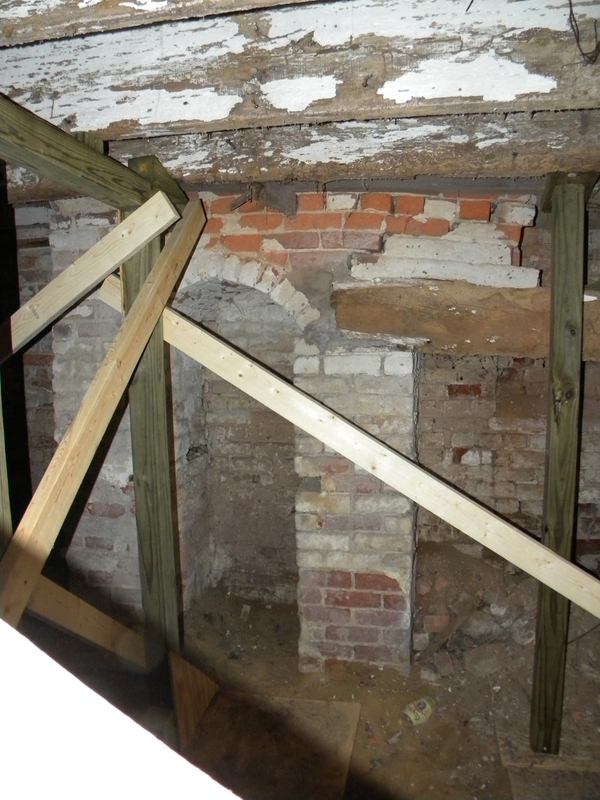 Recently, I was hired to do a property history for a new property owner’s birthday present. 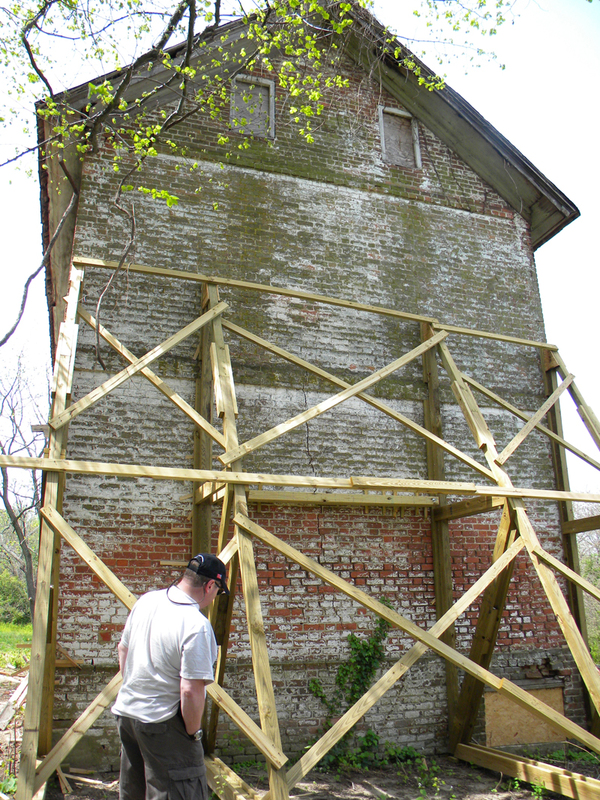 The 18th-century home and land I researched were purchased last year for conversion into a vacation rental. Below is the land’s history and some photos of the property (click on the images for larger versions). Waterside view of Mulberry Point. The two-story porch was added during a recent renovation. The property today known as Mulberry Point can be traced back to the mid 1660s. It has seen many owners and names over the years. Residents and owners participated in the War of 1812 and the Revolutionary War. Some residents were slave owners. Several residents died on the property and at least one was buried there. View from down the dock on Broad Creek, originally known as Second Creek, near Bozman, Md., in Talbot County. 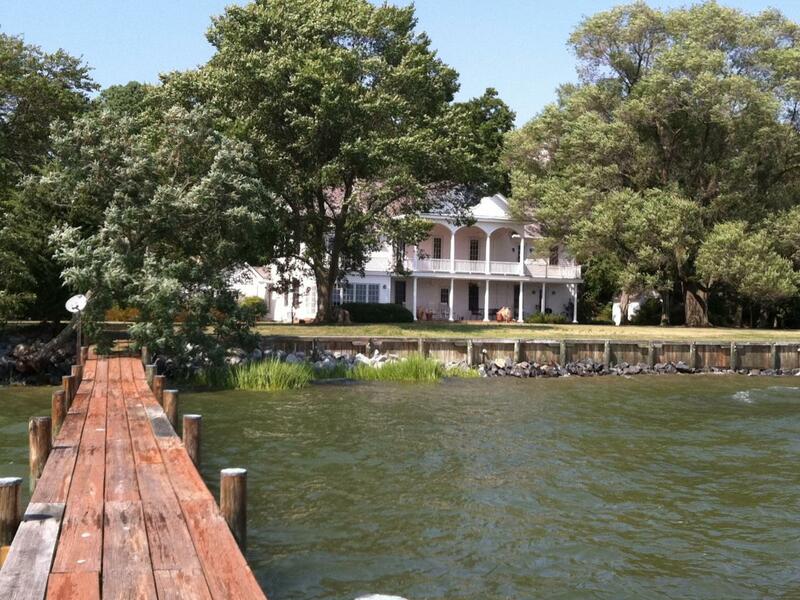 The ownership history of the waterfront property, located on Broad Creek near Bozman, Md., is quite complicated — pieces of the property were split up and reunited over the years, in different configurations. 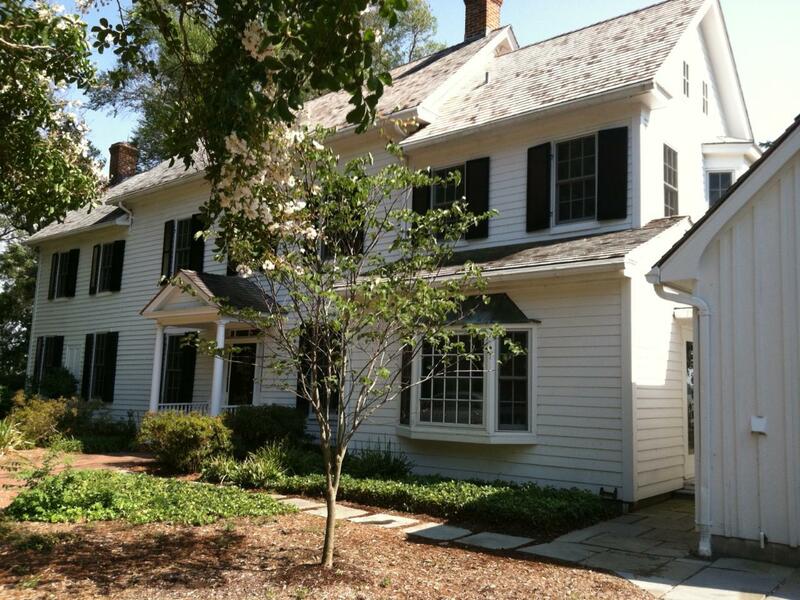 The main home was built in 1752 and has undergone extensive renovations. The windows and the front door, with its transom, lead me to call this a Georgian-style home. A view of the front of Mulberry Point. 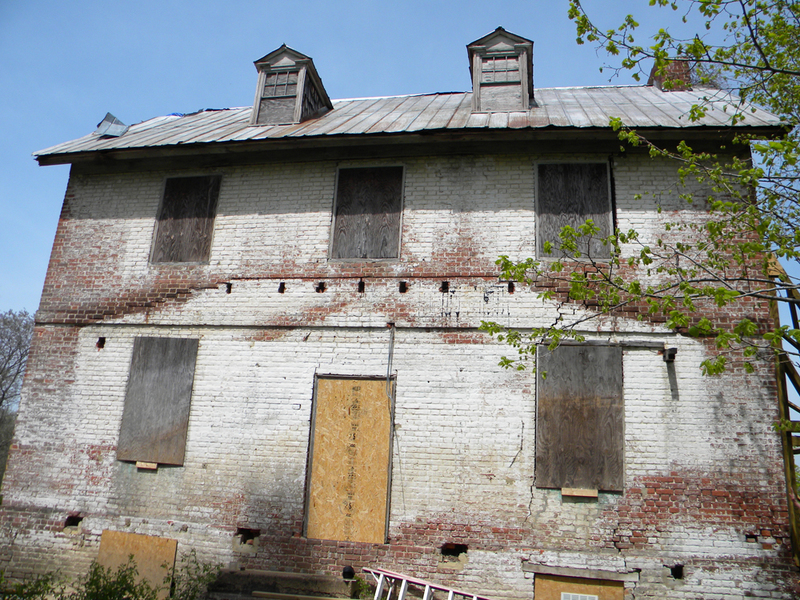 Tax records show the house was built in 1752. One of the outbuildings may be even older. Check out the details on the doors of this shed below. 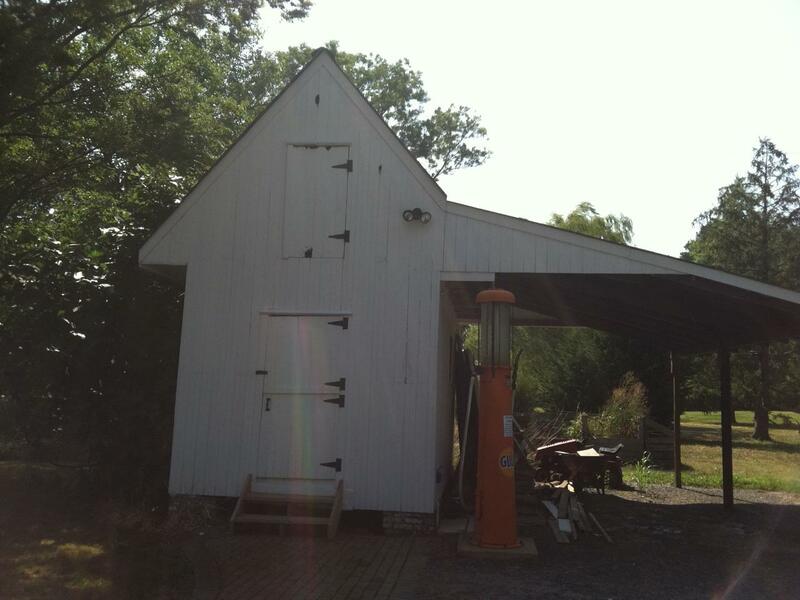 That's a neat old gas pump too! The Harrison family held the land for the longest period of time. Margaret (Harrison) Benson and her husband George* sold the land to a different family in 1865 for the sum of $4,325. It has changed hands many times since. Margaret Benson was the daughter of James Inloes Harrison. The Bensons took over the land from Harrison’s sister, Mrs. Ann Caulk, widow of William Caulk. The Bensons were slave owners, as evidenced by an exchange of slaves between the Harrisons and the Bensons in the distribution of the estate of James Inloes Harrison. Ann Caulk’s will, which distributed slaves to her heirs, was disputed by heirs of her brother, James. In the resulting ruling, Margaret Benson was awarded the following slaves: Thomas who was 28 years old and valued at $800; a 10-year-old slave named Harriet, valued at $400; a 24-year-old woman named Molly, valued at $250; an infant also named Molly (6 months old), valued at $50; as well as another 10-year-old girl named Frances, valued at $350. Since the Bensons sold the property in 1865, one can imagine that when they had to give up their slaves after the Civil War, they might not have been able to maintain the property anymore, forcing them to sell. It’s just a theory, but it fits the timeframe. James Inloes Harrison died at Mulberry Point 30 October 1855 (he is buried in Bozman Cemetery). Arthur Harrison, the son of James Inloes Harrison, was buried at Mulberry Point and his tombstone was eventually found in the water on the north side of the house by the children of more recent owners. Ann Caulk and James Inloes Harrison were the children of Thomas Harrison and Elizabeth Inloes. 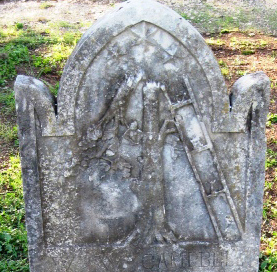 Ann Caulk died in 1854 and is buried at Mulberry Point. Her husband William was a major in the War of 1812 and was known as a prosperous farmer. William served under General Perry Benson in the 26th Talbot Regiment. William resided at a plantation by the name of Lostock near Mulberry Point. Ann Caulk presumably moved to Mulberry Point after the death of her husband. Ann Caulk was left Mulberry Point by Samuel Harrison, her uncle. Samuel Harrison obtained the land from William Harrison in 1825 for $1,940.50, but it does not appear that he lived there. At that time, the pieces of land were called Harrison’s Security and Freeman’s Rest & Vacancy Added, totaling about 167 acres, as well as part of a tract called Harrison’s Partnership. The Harrisons obtained these lands from Robert Haddaway in the late 1790s. Broad Creek at that time was known as Second Creek. It appears that tracts by the name of Haddaway’s Discovery and Hap Hazard were located to the south of what is now Mulberry Point. 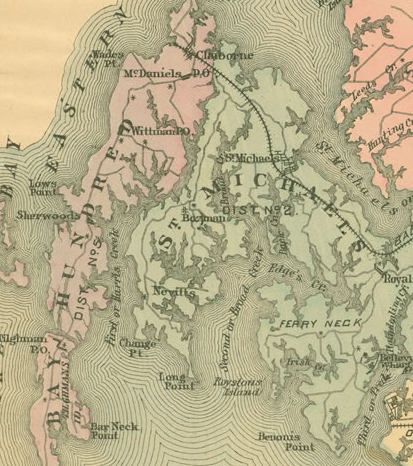 Detail of circa-1900 map of Talbot County. The lands were passed down to Haddaway by his parents, William Webb Haddaway and Frances (Harrison) Haddaway, who obtained them through the will of her father, John Harrison. Robert Haddaway was a house carpenter according to land records (he also is listed as a farmer in a mortgage to Thomas Harrison). 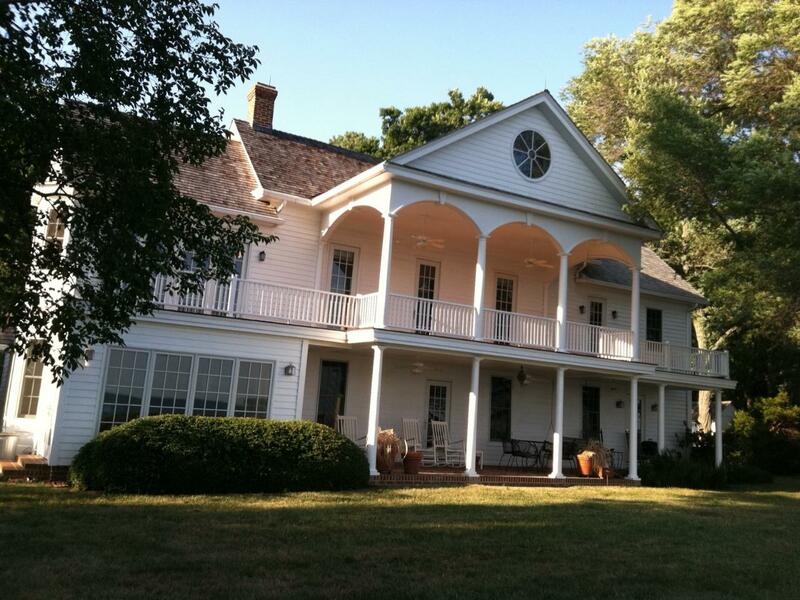 The main residence at Mulberry Point was built in 1752, according to tax records. The owners at that time were Robert Haddaway’s parents — might he have helped to build the structure? William Webb Haddaway served in the Revolutionary War in the 38th Maryland Battalion, eventually achieving the rank of colonel. He was a slave owner, as the 1776 Maryland Colonial Census lists several blacks in his household. John Harrison’s will of 17 July 1744 gave his lands to Frances Harrison (William Webb Haddaway’s wife). John appears to have been willed the land by his grandfather, Robert Harrison, in 1718. Robert Harrison inherited lands called Prouses Point and Haphazard from his wife, Alice Oliver, when her mother, Mary Oliver, died. The portion containing Hap Hazard appears to have been given to John Harrison’s brother James and is to the south of what is now Mulberry Point. Prouses Point appears to have evolved into what is known today as Mulberry Point. Mary Oliver had been married to James Oliver, who obtained Prouses Point from George Prouse in 1668. Prouse had the land surveyed in 1664 at 100 acres. It appears he was an immigrant to Maryland and the original owner of the land patent for the property. *It’s possible that Margaret Benson’s husband George Benson was the great-grandson of Perry Benson, an officer in the Revolutionary War and War of 1812. George Benson’s father was Robert F. Benson (born in 1807). Perry Benson’s son James had a son by the name of Robert, also born in 1807. It is possible he was the father of George Benson. Ancestry.com. “Passenger and Immigration Lists Index, 1500s-1900s.” Record for George Prouse. (http://ancestry.com : accessed 8 February 2012). Ancestry.com. “Maryland Colonial Census, 1776.” Record for William Webb Haddaway. (http://ancestry.com : accessed 8 February 2012). Covington, Antoinette H. Harrisons of Talbot County. Tilghman, Md. : 1971. Leonard, R. Bernice. Talbot County Maryland Land Records 1740-1745. St. Michaels, Md. : 1987. Maryland, Talbot County. Distributions 1858-81, Liber NR 5, 33, distribution of the estate of James I. Harrison 25 Oct 1858. Circuit Court of Talbot County, Easton. Maryland State Archives microfilm, CR 90,289. Seymour, Helen. Caulk Family of Talbot County, Maryland. St. Michaels, Md. : 2002. Seymour, Helen. Thomas Harrison Descendants. St. Michaels, Md. : 2003. Stewart, Carole. Caulk Family Genealogy, 2007. Talbot County Free Library. “Map of Talbot County, Maryland.” Maryland Room — The Starin Collection – Talbot County. (http://www.tcfl.org : accessed 12 January 2012). Check Out My Article on Easton Savvy! 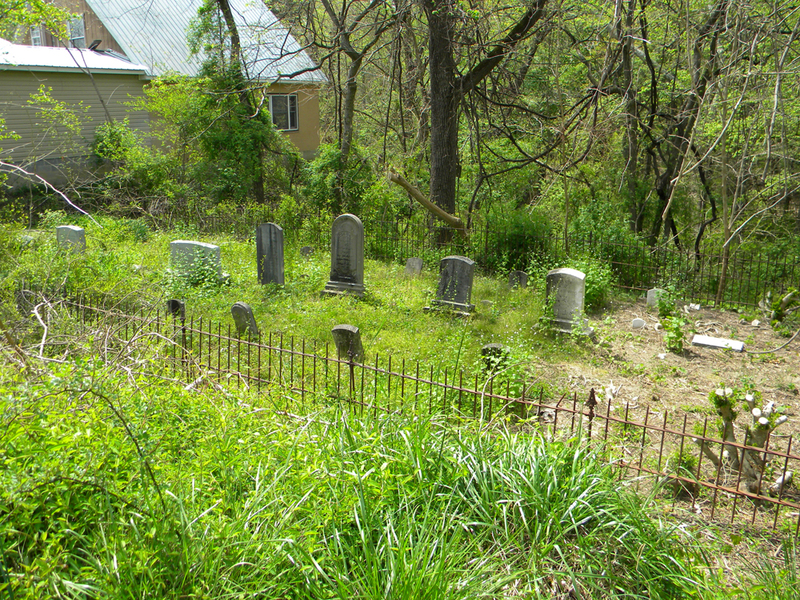 I wrote an article on stories from Spring Hill Cemetery in Easton, Md., for the web site Easton Savvy. Check it out here! One of my third great-grandmothers was Sophie Heimel who, according to her gravestone, was from Bavaria. I believe that she came to the U.S. in 1845 at the age of about 17. I haven’t jumped the pond to investigate her forebears, so please let me know if you share this surname. Sophie married Julius Hoyer, also from Germany, and they settled in San Antonio, Texas. Her FindaGrave memorial apparently includes text from her obituary. She died in 1883. The carving depicts a broken tree with what appears to be a wall leaning against it. I’ve never seen this type of imagery before. The broken tree, to me, seems to signify a life ended too short (he was only 34 when he died). I don’t know for sure if that’s a wall leaning in from the right. What do you all think? Ever seen anything like this? I want to do some more digging and see if I can find out how he died. 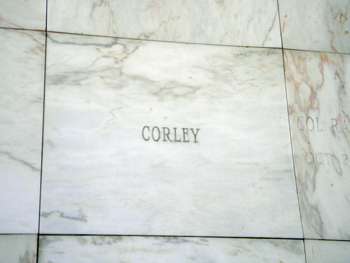 Note the masonic symbol, which is repeated in the larger headstone. Obviously, this smaller stone was added later by one of his children. I wonder if it was because the larger stone was already starting to wear? The FindaGrave memorial has the exact dates listed. I assume it’s easier to read the stone in person than in the photo provided. One interesting finding: William’s wife, Susan Elizabeth (Smith) Campbell died two years later, also at a very young age. 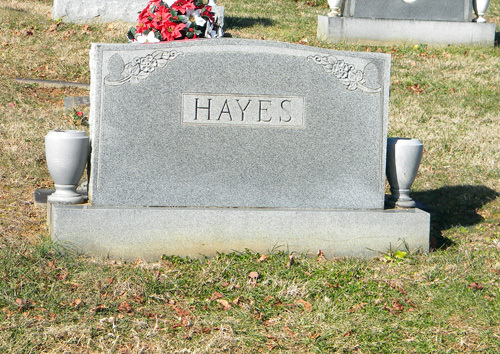 After viewing her FindaGrave memorial again, it’s even more apparent why new stones were made for these graves.